John Higgins (Scotland) won the 2010 totesport.com Welsh Open. The final against defending champion Allister Carter (England) was an impressive display of scoring power. He made breaks of 137, 101, 95, 81, 76, 72 (twice), 71, 59 and 54 in the 9-4 win. The Scot received £35,000 for the victory and runner-up Carter got £17,500. Ronnie O'Sullivan (England) and Stephen Maguire (Scotland) lost out in the semifinals. Higgins also had the highest break of the event, a 138 which earned him £2,000. 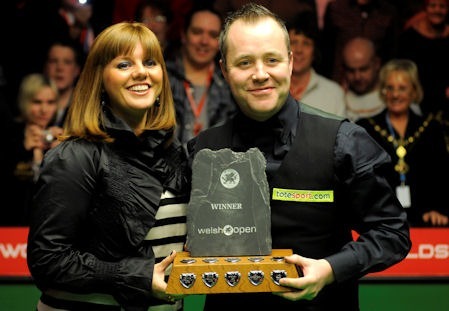 This was the second Welsh Open title for Higgins and his 21st ranking title. He also won the event in 2000. The win strengthens Higgins' lead in the provisional rankings. The next two also remain the same, with O'Sullivan in second and Neil Robertson (Australia) in third. The event took place at the Newport Center, Newport, Wales 25-31 January, 2010. Next up on the snooker calendar is the Sanyuan Foods China Open which starts 29 March 2010.